I’ve got a struggle, everyone. I’ve been using the new Kobo Aura H2O off and on for the last few weeks, switching between reading on it with reading on my overpriced but super damn slick Amazon Kindle Oasis. The two aren’t entirely comparable: The Oasis costs £270 and the Kobo goes for £140. 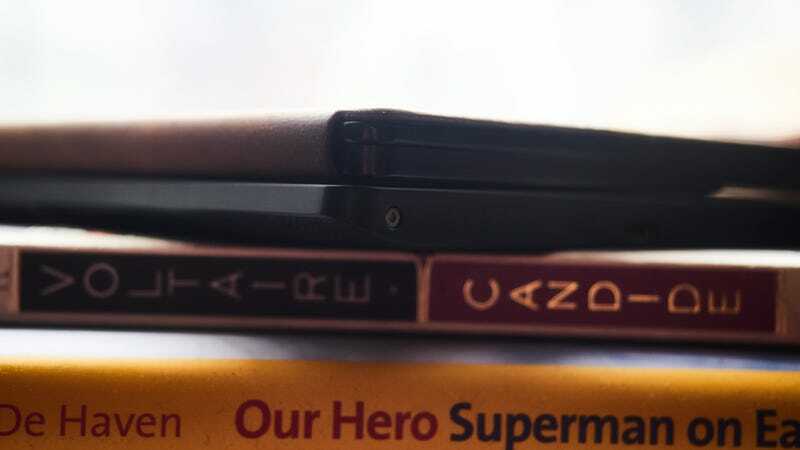 But the big difference between the two has nothing to do with price, or even hardware—it comes down to how I get the books on the Kobo. And as I plug the Aura into my laptop, again, to load on another book, again, I’m really forced to ask myself, again, why am I enduring this? The days of the e-reader wars are over. Years ago, Barnes & Noble and Amazon were in a vicious race for control of your digital literary library. Back then, there were genuine decisions for an avid book reader to make. There were ecosystems to choose from, each with its own pros and cons. Barnes & Noble’s Nook ecosystem had some cheaper books, as well as hack-friendly backlit hardware that could read content from open file types like ePubs. Amazon’s Kindle readers couldn’t read as many file types, but the device had a bigger library of buyable books, cheaper hardware, and the benefit of being the better-known e-reader out of the gate. Then there was Kobo, an upstart spun out of a Canadian bookseller (Indigo), with the backing of a lot of smaller bookstores in the US, like the now defunct Borders. It felt like an easy sell seven years ago. While it didn’t have as prodigious an ebook store on the device, it was a truly agnostic e-reader. Whether you were torrenting whole libraries online or supporting a small publisher, there was no single shop to swear allegiance to. Kobo even brought Overdrive to ereaders—a service that lets you check out ebooks from your local library. But times changed! Barnes & Noble slowed down production of Nook tablets in 2013, and hasn’t released a new e-reader since 2015. Since then, Amazon has opened its e-reader doors. Side-loading content onto a Kindle is relatively simple (though it still doesn’t support open file types) and acquiring content from local libraries via Overdrive is a breeze. Amazon’s e-readers have also improved—they’re lighter, more ergonomic, and easier to navigate than ever. 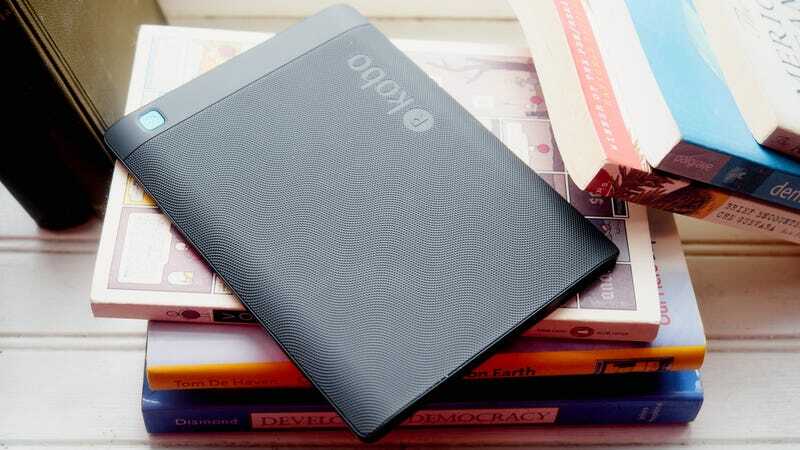 The earlier Kobo e-readers were popular amongst techies because they could read so many files, but does that openness still make it worthwhile? The e-ink display is great looking. This e-reader isn’t designed to be extraordinary—it’s designed to display books, with minimal fuss and maximum durability. And it looks absolutely boring. This is just another e-ink slab with a 265 pixels per inch display, whereas the comparably priced Kindle Voyage has a 300 ppi display. (Kobo’s more expensive Aura One gets to 300 ppi.) As with the 2015 Nook GlowLight Plus and the Kindle Paperwhite, you navigate on the Aura H2O by tapping the sides of the display. It’s eschewed any kind of buttons on the bezel, which means if your fingers are greasy then your e-ink display is greasy. There are some nice touches to the design. The 6.8-inch display is much larger than anything Amazon has for sale currently (The £190 Kobo Aura One has a whopping 7.8-inch display). So my mother, who insists she doesn’t need glasses even as she blows the text up to 400-per cent on her Paperwhite, will no doubt be thrilled. It’s also waterproof—because people go to the pool and beach and apparently don’t know how to keep their e-reader out of the water. Also the LEDs that backlight the display actually grow warmer as the day progresses so you don’t get doses of bright cool light when you’re trying to wind down at night with Nabokov’s Favourite Word Is Mauve. My Oasis has a bright white glow when I read it after 11pm, but the Aura H2O’s screen turns a dark orange, which is unattractive, but much easier on the eyes in total darkness. As e-readers go, the Kobo Aura H2O is entirely inoffensive. This is a solid, if a little chunky, piece of hardware with a few key features that I can only hope Amazon eventually embraces. 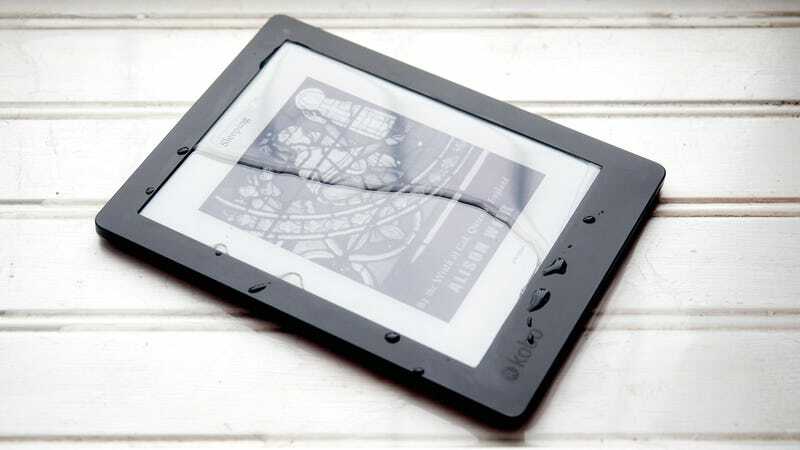 Changing the temperature of the backlight is a novel idea that works well, and as dopey as I think waterproofing an e-reader is, why shouldn’t it be waterproof? Kobo’s eBookstore has improved since the last time I wandered in. Every book I searched for was available directly from the Aura H2O and for the same price as on Amazon. And that, honestly, is where the decision lies. E-reader hardware is good enough at this point that you can grab anything from Amazon or Kobo and be happy. Some devices, like the Oasis, might be more luxuriously designed, but they’re all good. The leather case of the Oasis (top) versus the Aura H2O (bottom). So it comes down to getting that sweet content. If you’ve already embraced either Amazon or Kobo before then it’s a no brainer—stick with what you have. I’ve got a hundred books in my Kindle library and the idea of downloading each, ripping off the DRM and then loading it onto a competing e-reader is... less than appealing, particularly as I’ll lose all my metadata and bookmarks. Amazon also has the Prime library, which grants you access to plenty of free books if you’re a Prime member. And if you need to sideload a novel it can deliver books, including PDFs, via email. But Kindle only reads Amazon’s MOBI file type. If you buy an ebook directly from a small publisher (which means more money going to the actual creators) it will probably come as an ePub, and if you maybe scanned your favourite black and white comic series a decade ago so you could revisit it digitally whenever you want, then you probably packaged it as a CBZ file—a popular package for comics. 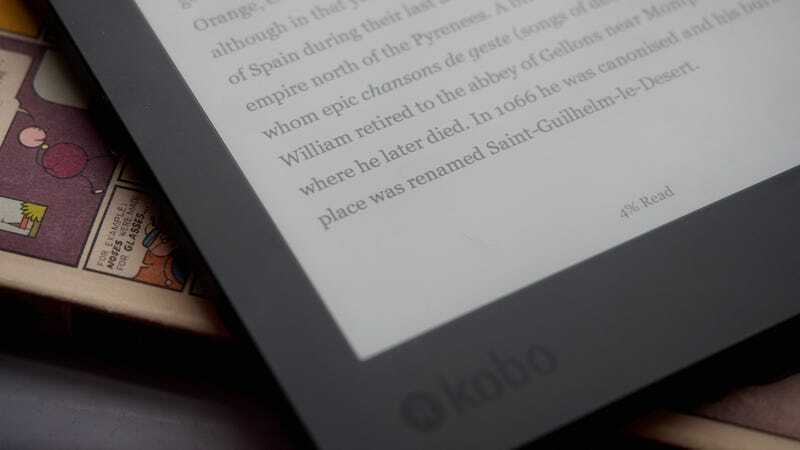 The Kobo can read those files without converting a single bit of code. You just plug the Kobo into a computer and drag and drop. Which is handy—but feels totally tedious after a couple years of emailing books to a Kindle. Unless you’re a passionate supporter of indie publishers or have a huge collection of reading material that isn’t in PDF or MOBI format, then the Kobo’s nicest feature is really damn useless. And that makes it hard to recommend the Kobo Aura H2O, or any other non-Amazon e-reader. There’s no real reason to go with them unless you’re just that morally repulsed by a corporation’s monopolization of our digital lives. 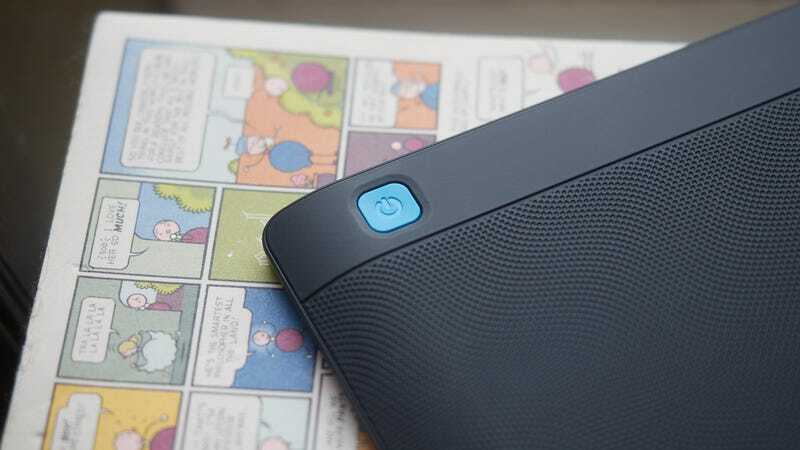 The Kobo Aura H20 is a great e-reader, but it’s for rebels. For the rest of us, there’s the Amazon Kindle. Maybe it can’t do as much, but what it does it does really dang well. It’s waterproof...which is cool I guess? The screen is bigger than anything Amazon is making, which is nice if you’re old. It can read more file types than anything Amazon is producing, but that might not matter to you. It’s not Amazon. Which means no Prime books, but also no further entangling of your life with a huge corporation.